My name is Charis, and I’m the communications coordinator for Volunteering Matters. I recently got the chance to interview one of our long standing volunteers to focus on our work with older and retired people, which is supported by players of People’s Postcode Lottery. Winifred, 64, is a telephone befriender and she chatted to me about her experiences. I had often seen her walk in and out of the office, and observed her making phone calls on a Wednesday afternoon, but I wanted to know more. Hi Winifred, can you tell me about yourself? We are called Befriending Matters, and I’m a telephone befriender. I call about 12 people every week, and their ages range from late 50s. The oldest person I was calling at one stage was 102! How did you get started with volunteering? Quite a few years ago, I moved into a block of flats and we were the only people in there with a child. The rest of the residents were older people, and I got to know them all. The people next door were 99 and 100, and when one of them died, the other was left on her own. She was very isolated and used to rap on my door every morning. What, just to say hello? Yup, and to give crisps at 6 o’clock in the morning…! There were similar things like that with the other residents. I found many of them talking to me, about how they felt isolated. At that point I felt as if I should do as much as I could for them. Then I realised I should really be volunteering with people in general, older people, and I saw an advert in the paper for a telephone befriender. I answered it back in 2006, and that’s how I ended up with CSV, and now Volunteering Matters, and I’ve been here for nearly ten years now! Can you tell me a bit about what you do as a befriender? I come to Volunteering Matters London office in Hackney once a week on Wednesday, from 4pm-7pm, and I call people in their homes. Many of the people I speak to can’t actually leave their homes, not having the kind of choices that we have to get up and walk out. So when I call them up they are delighted to hear from me. 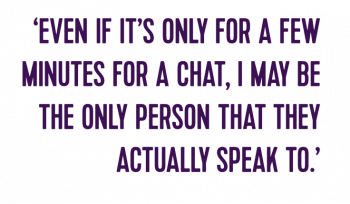 Even if it’s only for a few minutes for a chat, I may be the only person that they actually speak to. Is that a situation that many beneficiaries find themselves in? Oh yes. There are sometimes people that I call up that don’t want to speak to me, put the phone down on me, and that’s absolutely fine! So I’ll give them a telephone call back at a later point. People may be depressed, have mental health issues, dementia (which I’ve had training for), hearing problems. I’ve been lucky in one sense; my mum had a hearing problem all her life and we learned how to deal with that – talking to her in a certain way, talking clearly, and I do this as a befriender now. I sometimes have to make sure that their hearing aid isn’t buzzing in the background. Oh! And very, very politely tell people to turn down their TV, because they will be used to having a roaring TV in the background. I’ve had lots of dementia training. Sufferers may or may not remember you from one week to the next. Training is crucial to keep yourself up to date with how to handle situations. You’re not actually seeing these people you are talking to, and there can be all sorts of things going on in the background. That’s none of your business. You have a chat, if they want to chat that’s what happens. My background is in education; my background wasn’t in social care or anything. I worked in a university as a clerical officer for many, many years. I decided as I was talking to people to find out a lot about health and social care, so I did level 1 and 2 health and social care. It wasn’t needed to volunteer, but it meant that I would be prepared to talk to people and give them the information that I knew. Through my volunteering, and through taking the courses that I did, I ended up applying to the job that I’m doing now! I usually would have applied for admin jobs, and wouldn’t have considered applying. At that stage the telephone befriending project was called Citywise, and I have them to thank for that, because one of the project officers said ‘You should apply for that! You’re already doing that!’. I didn’t agree, but I applied for it anyway, and of course a lot of it was very much what I do. I’d done health and social care, and I’d decided to do it because of my volunteering, so I ended up getting a job! Volunteering can be a two way thing, for me I just wanted to help people. I live alone, but I’m not lonely, and there’s a difference. I have choices in my life. A lot of people that I call do not have those choices, and they can’t just get up and walk out the door. So they depend on people calling or family visiting. Lately, with all of the things happening with Grenfell, lots of people in Camden flats have been moved from their homes to hotels. So I had to find out where they were and where they had been moved to, catch up with them, and I found Camden council really helped me find them quickly. The sad but necessary part of befriending is end of life training. It’s needed, because the people I’m calling will often be in their 90s, 100, and you lose quite a lot of them. I have been invited to their funerals and met their relatives and grandchildren. I’ve even been able to give the grandchildren information about their grandmother. Never met the lady! But I could tell them how their Grandmother told me on the telephone how well the kids were doing at school and how much she loved them. I’m pretty strong in that way, my mum and dad died within three years of each other, and my son was very young, so I had to learn to make sure I was okay emotionally. I realised if I could do that, loving my parents as much as I did, and be okay sitting with my mum all night in a coma when I knew I wasn’t going to see her again, walk away and prepare the funeral… I knew if I was able to do that for my parents I would be able to be okay with situations that I can face here. What makes you stay as a volunteer? I’ve just always wanted to stay volunteering here, especially as the staff at Volunteering Matters were kind enough to make sure that I applied for a job. It’s not that I owe anyone, but I just feel that’s what I want to do. I’d find it very difficult to stop volunteering! I would miss it. 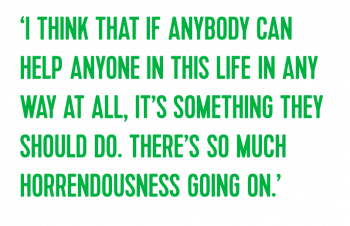 I think that if anybody can help anyone in this life in any way at all, it’s something they should do, there’s so much horrendousness going on. If one can call a person and it makes them feel the way that people have said to me… They’ve really thanked me and said ‘When I’m down, you talk to me on the telephone and you inspire me to get up and do things.’ I find that extraordinary. I also find it wonderful that I am privileged to be in a position where I can help people. You can’t just wander around calling people! So I found a charity, and you know, hopefully I am helpful to the charity and I will continue to do it for as long as I can!